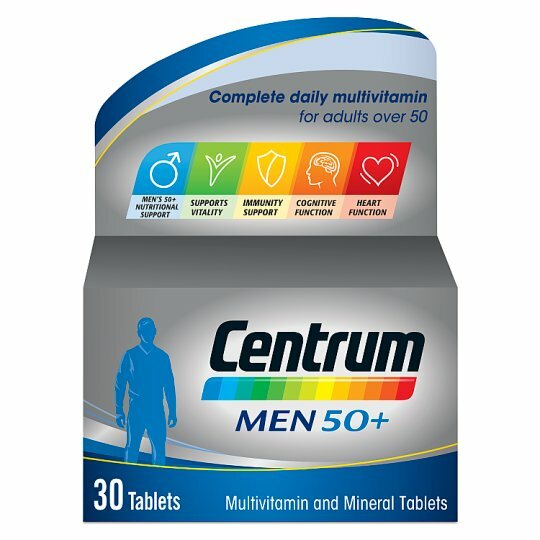 Men's 50+ Nutritional Support - A tailored blend of nutrients to support the changing needs of men over 50. Supports Vitality - Vitamin B2 and B5 to help release energy from your diet and contribute to your health. Cognitive Function - Iron contributes to normal cognitive function. Heart Function - Vitamin B1 to support normal heart function. Store in a cool dry place below 25ºC., Always replace the lid after use., For best before date, see side of carton. Take one tablet daily with water, preferably with food. Do not exceed the recommended daily dose. Suitable for adult men aged over 50. A healthy lifestyle and a varied and balanced diet are important. This product should not be used as a substitute for a varied diet and healthy lifestyle. If taking other supplements, please read the label as they may contain the same ingredients. Product contains iron which can be harmful to children if taken in large doses. The container inside this pack is sealed for your safety. Do not use if the foil is broken. Store out of sight and reach of young children.